I’m pretty happy with this one. It’s available through Zazzle for $3.55, less if you buy more. 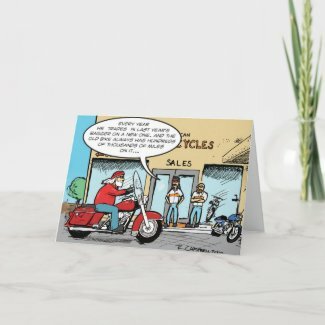 And by more, you can get discounts by purchasing a variety of cards from Cartoon Thunder or other Zazzle artists. Seasonally seasoned. Nice Looking card, and like the message. Are those two guys from the Sales Dept., and are they wearing [gasp] …Harley orange? Yeah…I tried to leave out the seasoning, but it just didn’t taste as good. And you couldn’t figure out who the guy in red was, even with the cute hat stickig out his saddle bags.